1st Choice Security Systems have been designing and installing world-class electric gates in Luton for more than 10 years. Our experienced team of security consultants and installers specialise in bespoke electric gates, which are precisely designed to meet your security requirements and to match the appearance of your property. Our security consultants and installers are well-trained, efficient and very professional. We take pride in our work and install electric gates that are quiet, efficient, reliable and most importantly — safe. An electric gate can greatly improve the security of your property and improve its resale value. We can integrate your new electric gate with other security systems you may have, including CCTV, access control mechanisms, alarms and much more. If you are interested in learning more about electric gates in Luton, contact our friendly staff today on 0800 118 2414. 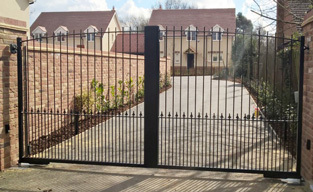 We have experience in fitting all kinds of automatic gates in areas such as Dunstable, Whipsnade, Studham, Flamstead, Harpenden, Lilley, Flitton & Greenfield, Pulloxhill, Barton Le Clay, Toddington, Old and New Bedford Road – See a recent gate project carried out for a local development of three houses in Greenfield, Bedfordshire. 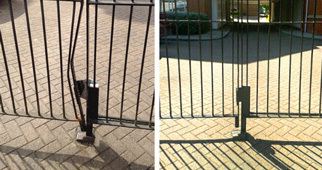 Looking for CAMSAFE Gate Repairs in Luton? Our CAMESAFE Installers have vast knowledge and experience to be able to offer the required security solutions and automation safety for all our electric gates in Luton. Crime continues to be a problem in Luton and surrounding suburbs. Between December 2014 and November 2015, there were 1008 incidences of anti-social behaviour, 577 cases if violent behaviour and sexual offences, 115 cases of criminal damage and arson, and 67 cases of burglary in the Luton Town Centre. The high crime rate demonstrates the need for home owners and businesses to install security devices around their properties. One of the most effective pieces of security infrastructure is an electric gate. It allows property owners to keep trespassers and criminals off their property, greatly reducing the risk of vandalism, robbery, arson and violent crimes. 1st Choice Security Systems install a wide variety of driveway gates to suit both commercial and residential installations. Our bespoke driveway gates are available in a wide range of materials and with various opening mechanisms. We tailor each driveway gate to perfectly match the security requirements, location constraints and safety considerations unique to your property. Our security consultants and installers can help you decide which type of driveway gate perfectly matches your security requirements, aesthetic requirements and location constraints. 1st Choice Security Systems have installed many automatic gates in Luton. Many home owners and commercial property owners in Luton prefer the convenience obtained from automatic gates — they take away the hassle of exiting your vehicle and can help improve security in commercial installations with high levels of traffic. Wrought iron gates are extremely durable, attractive and are available in a wide variety of designs. Many home owners use wrought iron gates in Luton, to improve the aesthetic of their home and its security. Wrought iron gates are commonly installed as driveway gates, footpath gates and security doors in Luton. Home owners can chose gate designs that match the look of their fence, garden and home. We have a range of ornamental designs that can improve the appearance of your property and increase its resale value. 1st Choice Security Systems are the leading installer of security gates in Luton. 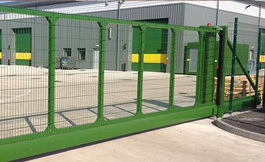 These gates are designed to restrict access from non-authorised personnel and to integrate with other security infrastructure on the property. Our bespoke security gates are available for any kind of entrance way including doors, shop fronts, windows, garages and driveways. Why Choose 1st Choice Security Systems for your Electric Gate in Luton? Our skilled and highly experienced staff have made 1st Choice Security Systems the leading security company in Luton. We have the expertise necessary to create highly-customised security installations and our services are excellent value-for-money. 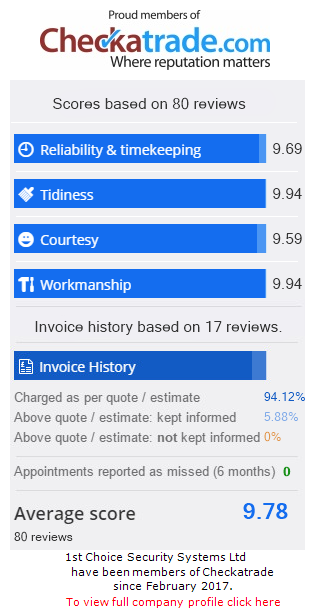 In addition to designing and installing electric gates in Luton, we also specialise in performing gate repairs in Luton. We can repair any kind of gate and opening mechanism, improving its performance, reliability and aesthetics. If you would like to learn more about Electric Gates in Luton, contact our friendly staff today on 0800 118 2414 for an obligation-free quote!